To my surprise, only a five minute walk from where I live, a small carnival suddenly sprung up. Like most children, I loved carnivals and everything about them from the unusual rides to the games to the cotton candy too of course! This photo was made using my Nikon D300 with Nikkor 50mm 1.8D lens while walking up the stairs to the tall burlap bag wavy slide ride. Yes, I was able to slide down at great speed and still keep my kit safe. When going on the standing centrifugal force ride, however, I laid the D300 down behind the scenes of the ride with the blessing of the entertaining ride operator. He spoke of how he wanted to visit Japan some day. The basketball game pictured next to the ferris wheel got $5 of my money. For sure on my third shot I thought it was money, but it only clanged off the front of the rim. Long, long ago I spent nearly $50 trying to win at the same game at a different carnival! 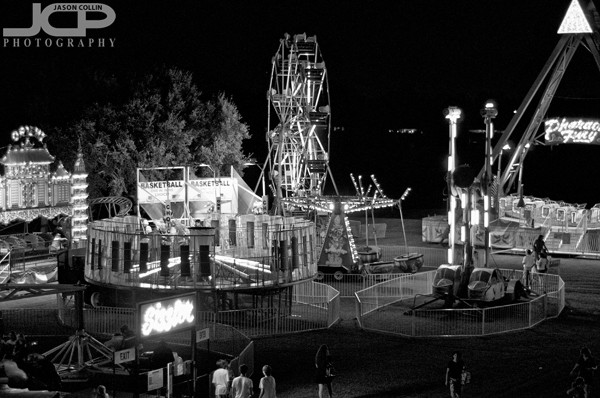 No doubt nothing more mysterious and exciting can come to one's own backyard than a carnival. Overnight an amusement park can replace a little used soccer field. These thoughts bounce through my head: who dreamed up these kinds of rides? when were they last inspected for safety? do I like the sense of danger of possibly hastily assembled rides? and I sure hope they have funnel cake!